The #1 Stereoscopic 3D Gaming (VR Gaming, 3D Gaming) and VR Resource | Meant to be Seen - Tim Partridge, EVP of Dolby 3D Follows Up! and Neil Schneider, President & CEO of MTBS (right) at 3D Biz-Ex. As promised, here is our follow-up interview with Tim Partridge, Executive Vice-President at Dolby Laboratories. He talks about Beowulf, answers a lot of our member questions about Dolby 3D technology, and throws in a lesson or two learned that could help the video game industry. 1. Is there an official list or information on which theatres are equipped with Dolby 3D? If they are not yet equipped, is there a list of theatres that are in the process of getting it? 2. How do the film’s left and right eyed images stay synchronized? Are two views interlaced, are there two separate digital reels on quality timers? How is it done? The two views are interleaved in the digital file on the server. They are then fed to the projector, and for a given frame of action, the left eye view is shown followed by the right eye. This is repeated two more times before moving on to the next frame of action. This is called triple flashing where the left eye is shown three times per frame and the right eye is shown three times per frame. Since there are 24 frames per second this means there are 144 alternating left/right views per second. The Dolby 3D color filter wheel is driven by Dolby DFC100 Digital Filter Controller to synchronize with this rate of 144 views per second such that the left eye views are always presented through the left color filter set and the right eye views are presented with the right eye colors to match the lenses in the glasses. 4. What format are movies encoded in? Is it a standard side by side format, or is it something more proprietary? The format of the movie is encoded in JPEG 2000 with the left and right eye views interleaved one after the other, as specified by the DCI (Digital Cinema Initiatives) for digital cinema movies. 5. How do you envision the on-screen movie getting converted to the home 3D screen? In particular, will movies played in a Dolby 3D movie theatre only work on a yet to exist Dolby 3D home solution? Is there an unofficial home 3D standard being used or in the works? Right now we are focused on ensuring that our 3D solution is seen by as many people as possible in cinemas. Plans for bringing 3D into the home have not been determined. 6. Can you elaborate on how Hollywood reacted to the benefit of camcorders not being able to properly record stereoscopic 3D (S-3D) content? How important is this for their S-3D purchasing decision? I think everyone is happy that digital 3D technology presents a further barrier to piracy and view it as an added benefit. However, the biggest driver, in our opinion, for why exhibitors are purchasing 3D systems is the ability to enhance the cinema going experience and bring more patrons to their theatres. 7. Dolby has a history of introducing audio solutions for the theatre, and then translating them to the home market. Prologic Surround Sound and Dolby Digital are perfect examples of that. Do you see Dolby 3D being a home solution one day? What form do you see it taking? As mentioned previously, our plans right now are exclusively focused on bringing digital 3D to cinemas worldwide. You are right, once the level of experience is raised in the theatre then that can often drive a desire from consumers to demand a similar experience in the home and as you know there are already some consumer 3D technologies out there. We really believe though that the premiere movie experience will always be in the theatre with a big screen, great surround sound, a crowd of people sharing the same experience, and of course plenty of popcorn. 8. A member suggested that in his research, he found that the expense of the Infitec glasses ($50 each) is mostly licensing and that they could be made cheaper. If that is true, when will the "cheap" glasses appear? To clarify, the list price for the Dolby 3D glasses are $59 per pair. They are designed to be used hundreds of times. Because they are reusable, the per-ticket cost of the glasses is well below the current cost of disposable 3D glasses. And of course the reusable model is much more environmentally friendly since you are not throwing away tons of plastic after each and every screening. However, the licensing fee is very reasonable. The glasses are expensive due to the sophisticated filter design that we have chosen to get the quality we want in the cinema, and the manufacturing cost of producing these filters. With the increase in volume and demand for 3D, the cost of developing and delivering this technology should decrease. 9. Although the silver screens and digital projectors for polarized stereoscopic 3D solutions cost more, the glasses, even the plastic circular polarized ones they use, are a fraction of the price of the Infitec ones and are disposible. Cleaning costs money too. The impression is that on a per film or per theatre basis, the Dolby 3D system is going to cost more for now. Is there truth to this? Why or why not? As mentioned above, we believe that the reusable model ends up being more cost efficient, as the per-ticket cost of the glasses is well below the current cost of disposable 3D glasses. Glasses can be cleaned and reused hundreds of times with no degradation. And don’t forget the cost to the environment too! 10. At $59 a pair with at least two pairs per seat in each theatre, it’s a sizable investment (almost $24,000 per 200 seat theatre). It’s unfortunate, but there is always the risk of vandalism, damage, and loss. Does Dolby provide some kind of insurance on the glasses, and how many glasses can each exhibitor afford to lose per showing before the exhibitor goes from profit to loss? As mentioned above, we’ve taken great lengths to ensure that the reusable glasses model is cost effective for exhibitors. The glasses are extremely durable, lightweight, and high performance devices that are designed to be used hundreds of times. Dolby has also inserted a sensor in the glasses in case exhibitors want to install a detection device. Still, we have found that having a few cinema employees collecting the glasses after the movie has been a nice reminder for movie patrons to place the glasses into the bins. These methods have proven to be successful by 3D technology providers like IMAX who also use the reusable glasses model. In terms of the investment, think about having to buy disposables for each movie at say $1 each. First you have to estimate how many you will need, that is "how many people will come see this movie"? If the theatre estimates 10,000 pairs (not unlikely) that costs $10,000. Say the theatre gets it wrong. If they don’t order enough they need to order more. If they order too much they need to throw them away. In addition, the reusable model is not only cheaper, it is far easier to store 400 pairs than 10,000 pairs! 11. The Beowulf premier was a big success for the 3D industry with 40% of revenue coming from 3D theatres, a two to one ratio compared to traditional 2D theatres. Getting people in the theatre is one thing. What were people saying when they came out? Patrons came out of the theatre talking about how the Dolby 3D system created an experience like never seen before, similar to what occurred when we introduced Dolby Digital surround sound to the cinematic experience. 12. From a ticket sales point of view, Beowulf was number one in its first weekend. How much money does Beowulf need to make overall for S-3D movie theatre companies to declare it a resounding success for the industry? Obviously we all hope it will be a big success, and from what we have seen so far, it will be. With this and other big 3D films lined up in the near future we think exhibitors will soon see that an investment in Dolby 3D is well worth making. 13. If Beowulf is the success our industry hopes for, what’s your next step in the near future? 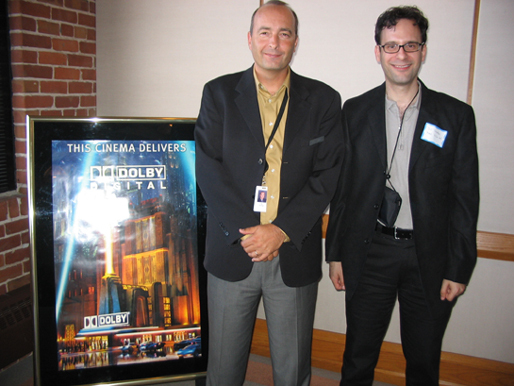 Our plan is to continue deploying Dolby 3D in theatres worldwide. There are many exciting 3D movies coming out in the months ahead, and we want to provide exhibitors with the best 3D technology that will keep their patrons coming back for more. 14. Up until now, films shown in movie theatres have been about story telling. S-3D was developed to enhance that. On the other hand, S-3D in theme parks is there to add thrill to their rides. With S-3D becoming a mass market product in leading movie theatres, do you see the rides moving out of the theme parks and into the theatres? Do you think we will start to see a different kind or classification of movie because of S-3D? You may see a small number of movies that really try to exploit the technology for the added excitement it brings and you may see certain scenes in movies that really take advantage of the 3D experience. But at the end of the day the movies are about storytelling and at Dolby we see all these technologies as just extra tools for the movie makers to use to tell their stories in a more compelling, engaging, and believable way. 15. S-3D movie theatres earned 2:1 revenue compared to 2D theatres for Beowulf’s first weekend. If the home stereoscopic 3D video game display hardware was well adopted, could you see a similar trend in video game sales? Why or why not? Clearly the 3D screenings are very popular with the movie going public which is no surprise to me since it is a much more immersive experience when seen in 3D. In that respect gaming is very similar to watching movies because you want to be immersed in the story as much as possible. In fact immersion is possibly even more important to gamers since you really are "in" the game, interacting with the characters. Anything that can make that seem more real will be welcomed by gamers everywhere. A truly effective 3D experience ought to be very popular with the gaming community. Thanks Tim! More exciting interviews coming down the pipe.